← Integrated Case Management – What is it? I attended the Future Salon meeting on Nov 1 at SAP Labs where they hosted three great short talks on the topic of the Future of Health. After a brief overview of the three speakers, I will focus on the one talk that I did not expect to see: a way for families to handle the unpredictable hurdles of caring for loved ones with special needs. This series of talks apparently goes back ten years, and if this meeting is representative it is a little known gem for Silicon Valley futurists. Each speaker presented for ~15 minutes followed by ample time for questions and direct interaction. Christine Peterson – spoke about the Quantified Self movement where adherents measure everything they can about the functioning of their bodies, collect a large pile of personal analytic data, and use that to gain insight into how their behavior is effecting their health. This is health care meets computer geeks. He message was clear and timely: The current system is better describe as “sick care” than health care, and you don’t need to be a victim. You can take charge of your own health and there is a wealth of modern tools to help you do it. My favorite quote is aptly tuned to the Silicon Valley audience: “you should know more about how you body works than you do about how your computer works.” If you don’t know about this movement, it is time to check into it. It puts a new meaning on “Personal Computing”. Adam Bosworth – spoke about developing a game at Keas to help people learn and keep healthy habits. They call it “Social Wellness” and it seems to really work. Designed for companies that self-insure, so they are motivated to keep people healthy. The game allows people to keep track of healthy things they do, but it is a little sneakier than that. By grouping people into teams that get scored together they tap into using peer support to keep everyone involved in making sure the others are keeping up. It makes a lot of sense. Faheem Ahmed – spoke about his new project to provide cloud-based resources for people to help care for family members. I understand that even though SAP hosts the meetings, they normally take no role in the presentations, however in this special case this project is an excellent fit. He is calling it “Care Circles” and the rest of this post is about it. The idea is that there is a patient with a long term condition needing care. Examples include care for the very young, such as Autism, Down Syndrome, Cerebral Palsy, fragile X, or for the very old, such as Alzheimer’s, brain tumors, Parkinsons. These conditions call mainly on another family member, who is often overwhelmed by this challenging task. How can other be brought in to help? This includes other family members, friends as well as professional care givers as needed. It is easy to imagine that coordination can be difficult. Ahmed sees cloud technology connecting family and friends to coordinate better. A log of what has been happening. His example looked a lot like Facebook’s activity stream on purpose: it is something that people are familiar with, and can manipulate easily. Documents specific to the patient, or even general newsworthy articles collected together. Access Control: He insisted that sharing is completely under the control of the primary care giver. A given participant might be able to see a lot, a little, or maybe none of the contents. Medical establishment are tightly regulated on what information can be shared under what circumstances. Being independent of medical establishments is a big advantage to the at-home care giver to be free to share, and not share, in whatever way is necessary. The main focus is not about automating the work, but instead simply keeping all the participants on the same page. Specific care activities can be planned and scheduled in advance, and the other participants can be informed. Specific care events can be recorded, not only helping keep the day to day activities from being duplicated or missed, but it also forms a long term history of the care that can be studied over time for what has and has not worked in the past. One of the most important aspects is to help the caregivers cope with things that turn up unexpectedly: There was a plan to do X, but then something was cancelled, which may require lots of people to shift around their activities. Having this all in a shared space can greatly relieve the coordination overhead. i lot of work is going into making the system very easy to use. It has to be oriented to non-professional home care givers across the board. The UI is clean and uncomplicated. It had a certain IPad look to it. What we see here is an excellent example of Adaptive Case Management. The main caregiver is the knowledge worker in this case, and is in control of the case the way that a case manager is. The documents and information are collected into a case folder giving you a single point to access all the things that are relevant to completing the case. Family and friends form the other team members who are allowed access to the case folder in varying degrees. The strategy is essentially a plan composed of goals to be achieved. The ledger is a history of what has happened, including notes which form a kind of conversation. It clearly is “adaptive” because of the way that there are NO constraints on what can be put in the steps of the plan. If someone gets the bright idea that “eating a jello dessert” might help the situation, it can be easily incorporated into the plan, along with other, more serious operations. The focus is decidedly not on attempting to identify the one, correct way to treat a particular disease, but instead on communications between the individuals in situations that are largely unique. How can we let everyone know what has been happening, what we are planning to do, and use this to help out. He did not go into details on the access control, and I suspect that this will be more difficult than he let on. It is fine to say that everything is controlled by the case manager, but over time, when the number of artifacts gets large, it can be overwhelming and tedious to have to adjust each document and record. This remains a significant challenge and a research topic in ACM. It will be interesting to see, once the service is launched, what capabilities they include to make this easier. It is easy to see how this would be a tremendous help to these at-home long term health care providers. When the time comes that you need to involve a specialist, you have all the information in one place, giving the doctor a much more complete view into what has been happening. It also gives the doctor a place to create or modify the existing strategy. 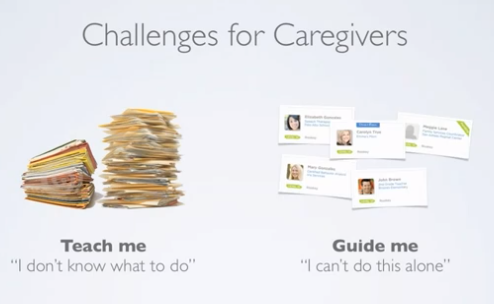 Each caregiver can adapt the environment to their own specific situation and requirements. The focus is not on automating the care, but supporting communications, and communications is the core of coordination. Care Circle (www.carecircle.net) is a cloud based collaborative space on any topic designed to help people take action on global issues. Care Circle (www.carecircle.com) a fee based service for friend helping friends, and a couple of the examples given are mdeical examples. Single and seriously ill: Care circles fill in for family – Today Health from NBCNews gives an overview of the situation that a care recipient might be in . There is an Australian program called Care Circles for child wellbeing. Circles of Care is a not-for-profit corporation offering health care in Florida. Patient-Centered Medical Home (PCMH) it a term being used to describe team-based model of care led by a personal physician who provides continuous and coordinated care throughout a patient’s lifetime to maximize health outcomes. Also mentioned by NCQA and the Patient-Centered Primary Care Collaborative. eCaring.com: Have something called Care Tracker described as the missing piece in Home Healthcare; comprehensive information about the care and conditions of a home care recipient. Very simple iconic interface to record condition of patients. Calendar like display of historical conditions. Includes payroll information to track working time by care givers. This entry was posted in Adaptive Case Management and tagged alzheimer's disease, autism, cloud, healthcare, medical. Bookmark the permalink. 3 Responses to ACM for Home Medical Caregivers? Amdocs launches cloud-based eHealth solutions for the elderly. Home Health Monitoring can monitor multiple chronic diseases, collect personal health records, analyze patients’ home test results and send necessary alerts to healthcare practitioners. It also includes a secure portal for patients and doctors/care practitioners that can be accessed from remote monitoring centers.